Non Stock Product. Ships directly from manufacturer. 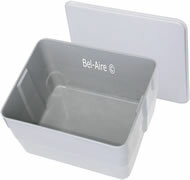 Industrial grade, US manufactured by MFG Tray Corp. Lid is included. Perfect size for two 13" x 16" cells. This tub is 12" deep, we found that 12 gallons will fill this tub to 10" deep. The fiberglass is very sturdy and will not deflect when full of soap and water. The tub could be picked up while full of cells and water (water sloshes out). The super fine particulate from the cells will leave a grease-like ring. This particulate would infuse in to soft plastic tubs or the dishwasher. The molded fiberglass surface is hard but smooth and impervious to the super fine particulate. 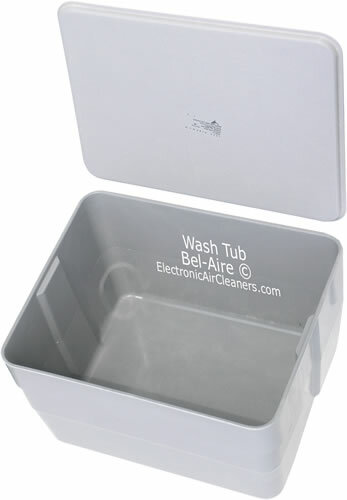 PLEASE NOTE that the wash tub is manufactured to order and ships directly from the factory. There may be a delay of up to a week before shipping. Inside bottom dimensions are 17¼ x 14¾". Inside depth is 12 inches. When cleaning the prefilter be careful not to flatten down the woven foil. The aluminum weave can be easily flattened with water pressure or when cleaning with a brush. Soaking the prefilters in a tub is recommended. See your owner's manual for washing instructions. We recommend soaking the collector cells. Soaking cleans better than the dishwasher and cleans better than a pressure washer. The cells typically do not need to be cleaned as often as the prefilters. After cleaning, inspect the cell plates for dirt, hold the cell up to light. View the plates through the ionizing section to see the dirtiest side. Note that only every other plate captures dirt. The plates are either charged or grounded. The charged particles are attracted to the grounded plates and repelled by the charged plates. Closely check the grounded plates, where as the charged plates will clean easily. Honeywell recommends wiping down the ionizing wires when washing the collector cells. Also check the wires for roughness, a side effect of the corona discharge is the growth of a white quartz layer. Air near the high-voltage ionizer wires breaks down in to ions and high energy electrons. This mixture of ions and electrons is called the corona plasma. The ions collide with suspended particulate and confer the charge. The plasma has an unintended reaction with cyclomethicone, a silicone oil present in household products such as deodorant sprays and skin lotions. This reaction leaves deposits of solid silicon dioxide on the ionizing wires. 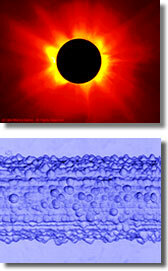 These insulating formations will significantly suppress the corona pattern and intensity. Research has shown cleaning the wires with 600 grit emery cloth will remove the silicon dioxide. But at the risk of damaging the wire surface or breaking the wire. Aprilaire 412 Super Filter Coat increases efficiency and dust holding capacity of prefilters used in electronic air cleaners. The Super Coat adhesive have a unique viscosity oil in a gel-like straucture. This viscosity oil constantly absorbs dirt particles. As particles are trapped, they recede into the interior of the adhesive, and throught the circulation of the low viscosity oil a renewed impurity absorbing surface is established. This action provides a continuous impurity absorbing surface layer. The aluminum mesh prefilters will maintain their initial efficiency with periodic applications of RP Super Filter Coat after cleaning. After a period of use of the prefilter, dirt, lint and the original water soluble adhesive coating are easily removed by simply flushing the filter in a stream of water. A new, easily-applied coating of RP Super Filter Coat can restores the filter's superior performance qualities.